The largest indoor boatshow on the planet opens in just four days! 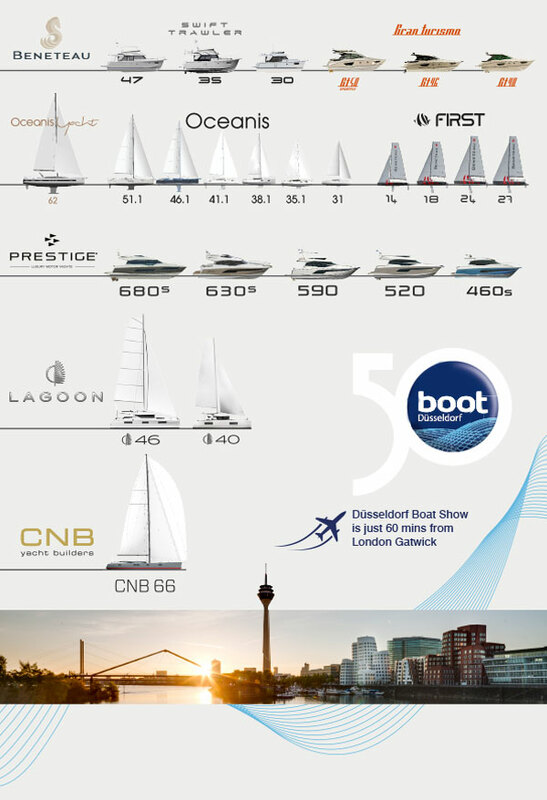 With no London Boat Show this year, many buyers have plans to visit the impressive Dusseldorf Boat Show between the 19 - 27th Jan.
With more than 1800 boats on display from all major brands including: Beneteau, Lagoon, CNB and Prestige across 18 halls, if you are seriously looking for a new boat, or just need a January boat fix, then this is a show not to miss. The exhibition venue itself is just an hour from most UK airports by air and due to the scale of the show, it is worth taking a couple of days to visit. Düsseldorf is the home of some very important art and culture and the old town captivates you with its picture-perfect, historically listed buildings, its many bars and luxury shopping. 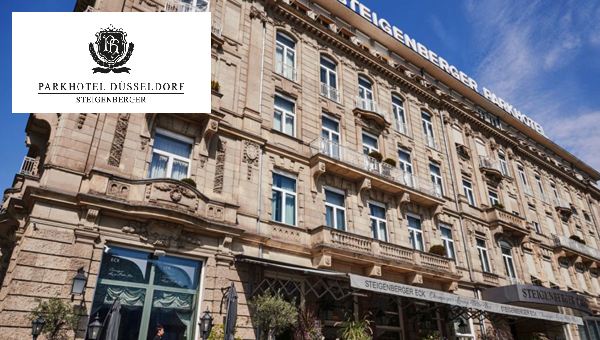 We recommend you stay at the Steigenberger Park Hotel located on the banks of the Rhine, within walking distance of the famous old town, the chic shopping street Königsallee and a lively cultural scene. Contact Ancasta now for exclusive booking details and we can help arrange your stay including accomodation and transfers to and from the show. FREE OWNERSHIP PAPERWORK CHECK IN JANUARY & FEBRUARY 2019! Sadly, very often we see Ownership Paperwork for boats that is incomplete. A missing VAT invoice, Builders Certificate, RCD compliance and even an inaccurately filled-out Bill of Sale can make it very difficult (and sometimes impossible) to sell your boat for her full market value. Dont leave it until you decide to sell to find out if you have the necessary paperwork please call your nearest Ancasta office to make an appointment and our knowledgeable, experienced and friendly Brokers will check over your paperwork and advise you if you have everything you need to sell your boat on with full clear Title. If you are thinking of selling your boat, we have buyers waiting and a competitive rate of commission so contact your local Ancasta office now to take advantage of this offer. Over 500 boats for sale, see: HERE. Based in Hamble, HYSRR are well placed to take care of all your boating needs anywhere in the Solent region and beyond. Typically the winterisation process includes the following: winterisation of the engine, generator, WC and batteries. A thorough check of the alternator, starter motor, engine mounts, lubricants and underwater fittings. Outdrive service, cathodic protection and full gas system check where applicable. There are many more options including antifouling and giving new life to your topsides so for complete piece of mind it is worth talking to one of the technicians at HYS Refit and Repair to make sure your boat is professionally cared for. Call now to discuss your rigging requirements. Specialists in all forms of standing and running rigging. Manufacturers of rod, composite and wire rigging and service agents, distributors and suppliers for some of the worlds leading brands including, Reckmann, OYS, Leisure furl, Future Fibres, Gottifredi Maffioli, Kingfisher and Liros Ropes. Whether youre looking for the most cost-effective cruising rigging, a high performance set of rods or composite rigging, or the addition of any new rigging equipment, Advanced Rigging are equipped to provide detailed impartial advice, delivery and installation where required for yachts of any size. Call the team now in Hamble or Cowes. Drop by stand J211 at The Southampton Boat Show 14th - 23rd Sept 18. Providing a 24/7 brokerage service at office run by Kevin MacDonald Ancasta's new office is virtual which means that Kevin works across the twelve marinas in the area from Christchurch to Bridport with The Royal Motor Yacht Club, Poole Town Quay Marin, and Portland Marina in between. Posted on 5 Nov 2018 Considering selling your boat this Winter?